Don Jones, who's also an anchor for NBC 17 Today, happened to take a shot of his rear wheel hot in action on one of his rides. He did it using his cell phone. He loves his wheels, don't get me wrong, but this article of perfect shape, pattern and symmetry appeared ridiculously warped in the resulting image. Given that Don is an award winning news anchor who has traveled all around the world in the name of journalism, we all thought this might be some strange manifestation of 'spokely' attraction towards celebrity star power. Before you mouth obscenities at your camera manufacturer, know the situation. The wheel is turning really fast. If there was a way to follow or track the motion of the spokes with the camera, you may have reproduced the image much better. Think of your camera as your own eye. Focus on a rotating wheel, keeping your eyes stationary. The spinning spokes appear like a blur that makes no sense to you apart from the fact that the motion is fast. But now spin the wheel much slower and try to track the spoke as it rotates around the hub. Much better? The characteristic warped spokes in the images above, I think, is a result of slow shutter speed. The camera has no way to track motion this fast in the perpendicular direction. Any camera with a shutter speed of lesser than 1/500th of a second will most probably produce this effect since they are incapable of freezing fast movement. A bicycle company definitely wouldn't prefer something like this to go into their product brochure. So I believe you can avoid this by using higher shutter speeds. In digital cameras, you can do this by increasing the ISO settings. However, you'll have to play around and experiment with the amount of noise you're getting in your images as a result. UPDATE/CORRECTION (11/25/08) : When I talked about shutter speeds above, I was pertaining to proper digital cameras. It must be mentioned that cellphones have no physical shutter at all. Instead, they use software to tell the camera how long to record light coming through the lens (mostly plastic). But because the internal processor and software are often slow, the lag between when you press the button and when the picture is captured can be a second or more. It will be interesting to see whether a digital camera with a good sensor and ISO range, when substituted instead of a cellphone, will eliminate the warping. Nevertheless, it is still a pretty cool effect. It is not really about shutter speed (or digital camera equivalent for it). The distorted spokes appear because the camera phone has a cheap cell which records the image sequentially row by row. The finish line camera on the row by row is a critical design feature (i.e. not a bug). The finish line camera continuously records the pixel column exactly on the finish line and composes a "never ending photo" of the things that pass over the finish line. Proper digital cameras have better cells (or a higher bandwidth from cell to memory) and are capable of recording the whole image at the same time. "In the finish line camera the row by row recording is a critical design feature (i.e. not a bug)." Thanks for the post Ron! Interesting points... with insight from the comments posted by "asb"... We know the fix but these kinds of pics are still cool to see. Asb, I made a correction about cellphones not having shutters. "asb" is correct. And to answer your question in the 11/25 update: A conventional camera with a shutter and either film or a digital sensor will *not* show this type of warping. A slow shutter speed can result in motion blur, but motion blur cannot bend straight lines into curves like this. 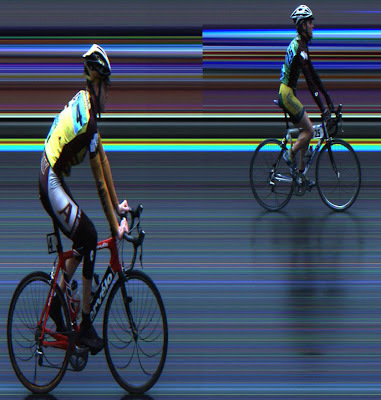 This effect is because of how the finish line "slit" camera works. It's recording the image in a thin vertical plane vs. time (the x axis). That's why the stationary background never changes and shows up as a horizontal smear. Spokes are not moving as they pass by the pavement, but at the top of the wheel they are moving twice as fast as the bike. Thus the spoke spacing in the finish line slit photo increases as you go from the top of the wheel to the bottom. As "asb" said, the cell phone case is an interesting effect due to how the digital sensor is read sequentially. It seems to cause a similar effect to the finish line camera. I'd never seen cell photos of moving wheels before. Thanks for pointing it out. That first image is absolutely splendid. Why couldn't I think of doing something like that? Could make an art piece you know. I love those images. Remember the old westerns when they showed a wagon racing along and the wheels looked like they were going backwards. Have a good US Thanksgiving. look up finish lynx. they do all the finish line cameras for major events. really interesting stuff.